Coconut whats? What the heck is a friand? This week’s French Fridays with Dorie recipe started with a google search. I had never heard of friands before and, since Dorie did not include a picture of this recipe, I had no idea what the heck I was supposed to be making. According to the brilliant minds over at Wikipedia, a friand is the australian version of the french Financier. Not exactly a huge help since I also don’t know what a financier is, but at least they had pictures. Looks kind of like an oval-shaped muffin. I’ll be interested to see what our australian Doristas have to say about this recipe. Dorie’s friand is made with shredded coconut and, may I say, not a small amount of it. In fact, it rather took over the dough. Luckily I have never had an aversion to coconut so I carried on as instructed. The only addition I made was at Dorie’s suggestion. In her Bonne Idees she points out that chopped fresh fruit can be added to the tops of these cakes and the perfectly ripe pineapple sitting on my counter was just begging to be let in on the fun. The batter came together very quickly and I spooned it into buttered muffin tins, topped off with a little chopped pineapple, and then into the oven. 35 minutes later my friands were a beautiful golden color. A little later I made some tea and piled a few friands on a plate to enjoy as a lazy Sunday afternoon snack. Up to this point I really had no expectations of this recipe one way or another and had no idea how it would taste. Verdict? De-lish! Surprisingly good! My husband and I both loved these. The little cakes were much moister than I had anticipated and had a great, vaguely tropical flavor. The next day they had dried out a bit, but were still tasty dunked into a cup of tea. I’m almost embarrassed to say that the two of us polished off the whole batch in just two days! Thanks FFwD! Another winning recipe which I never would have picked on my own. This entry was posted in french fridays with dorie and tagged Around my French Table, cake, cookies, dessert. Bookmark the permalink. Glad these were an enjoyable surprise for you! The pineapple sounds like it pushed the tropical flavor into a whole new place. If only I liked coconut, I would copy your idea. Your friands certainly look delicious. I really enjoyed these too – would never have guessed! Wish I had put some fruit in there – next time! Your little friands are gorgeous – so glad you liked them! Yum, pineapple sounds great. They are too good to keep around for long! We polished off two batches! Oooh, it’s like a pina colada in cake form! Man, I had a pineapple sitting on my counter (and still do. I better cut that up today.) and it never even occurred to me to add it to these cakes. I pretty much single-handedly polished these off (Matt ate one and Charlie ate two), so that should make you feel better about only eating half of them. haha! 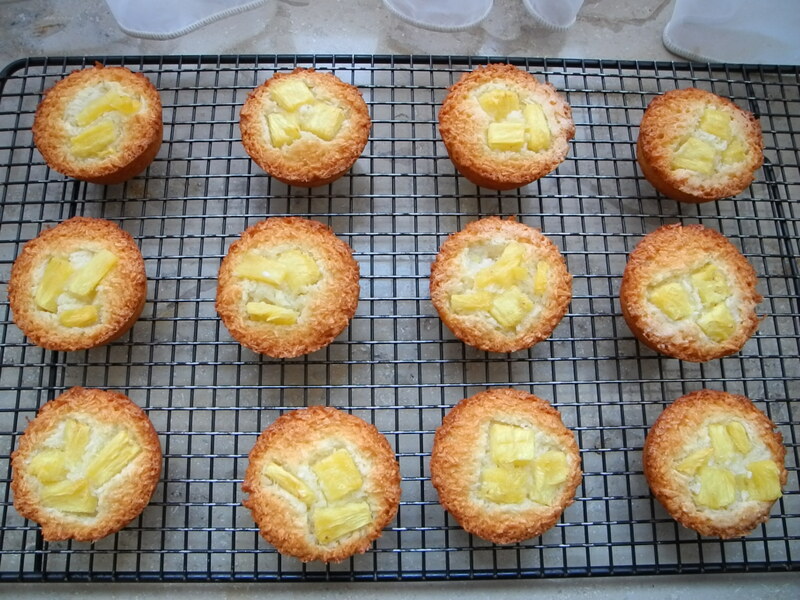 Your Coconut Pineapple Friands look delicious. Glad you and your hausband enjoyed them so much. I love your serving plate with the lovely flowers…nice post. …sorry, typo…of course, that should read “husband”…do not know what happened there. Have a great weekend! I have to say I wasn’t sure what a Friand was either…Yours came out so lovely and I love the idea of the fresh pineapple! Perfectly beautiful! Glad these were a hit for you! Have a great weekend! I love the combination of cocnut & pineapple! Very nicely done! Isn’t one of the great things about this group learning fancy names for simple things? It makes them sound so much fancier than they really are! LOL! This sounds like the best combination so far. I may have to go back to the bulk section for some more coconut!! 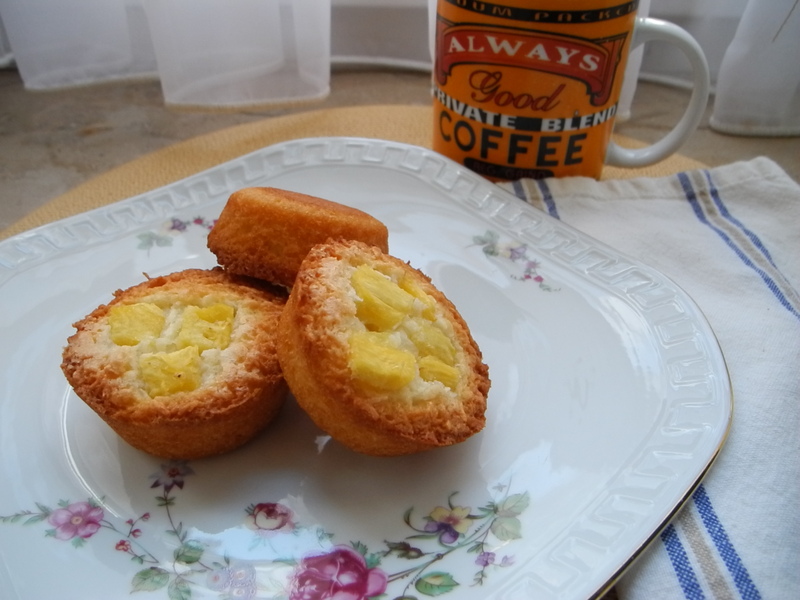 Great idea to add pineapple as topping for this coconut friands. Great combo. Your friands looks delish 🙂 Me me , I added fresh cranberries to my coconut friands and it was good. Have a nice weekend. We do like our friands here in Australia, but I have to say any I’ve made or eaten have been of the traditional almond meal variety. I’ve never had a coconut one before! It was delicious fresh out of the oven! But once cold, I guess I’d prefer the original version. I know what you mean about eating all of these…they just mysteriously slide right down…they just disappeared! Thanks for telling me you could not comment on my blog??? I am wondering why, but then I figured out that my comments are not being posted on other’s blogs either. I had to re-sign into google??? Some of my comments were working and some were not…hope I fixed my problem. I’ve been making lots of comments and I guess they are stuck out there in cyberspace and would not have known except you pointed out a problem. I should go back and re-comment, but I guess I’ll just start over next week. Anyway, enjoyed your post. “See” you next week. They also disappeared rather quickly at our house. I love your friands with the bits of pineapple. We just bought a couple of pineapples yesterday, so I want to try these. I also had never heard of a friand before. 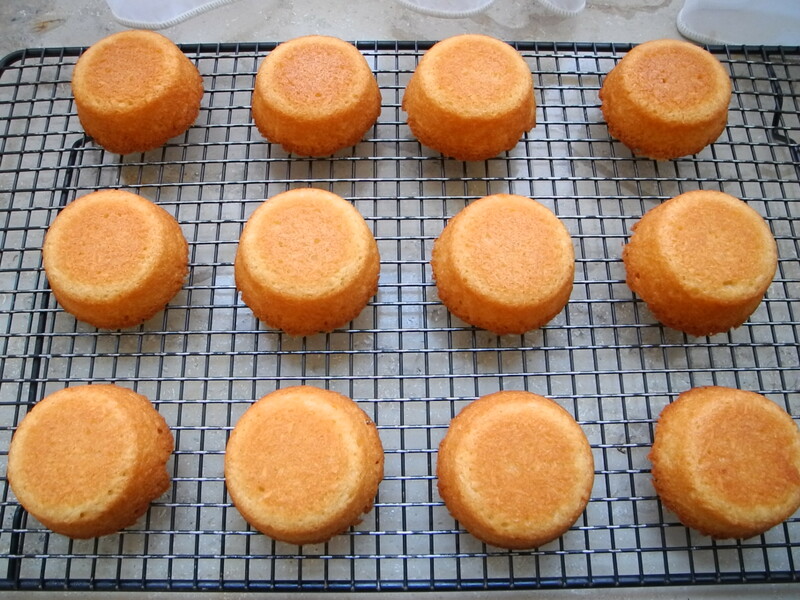 I have heard of financiers, but never made them so I hope we get to at some point. friands turned out well and look so inviting. Such a simple recipe, but the results were fantastic. I love your extra tropical version! I should have added fruit, too, but they were lovely without, too! 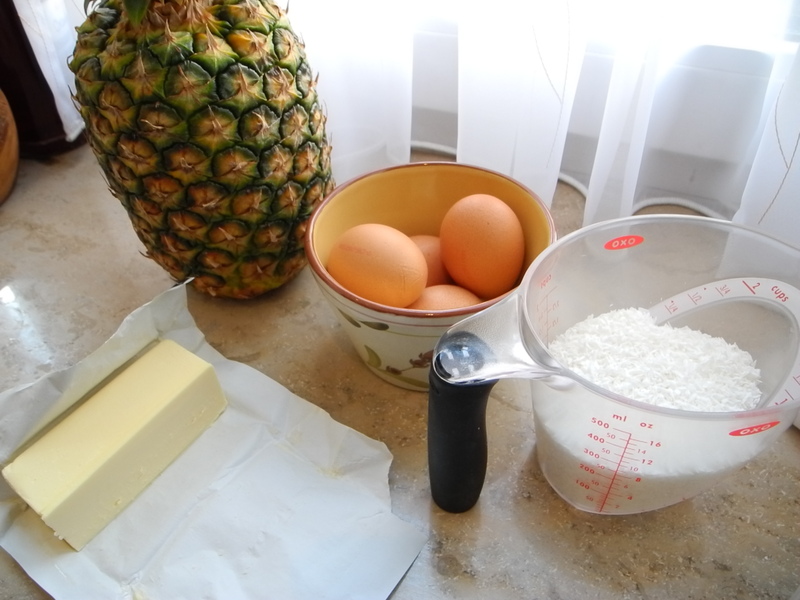 Nice idea to add pineapple – it looks delicious! Great post! These little babies look scrupmtious! Up until this recipe I thought a financier was what I did – lend money to those needed business or property loans, no wonder why so many people have confusing banking with baking! 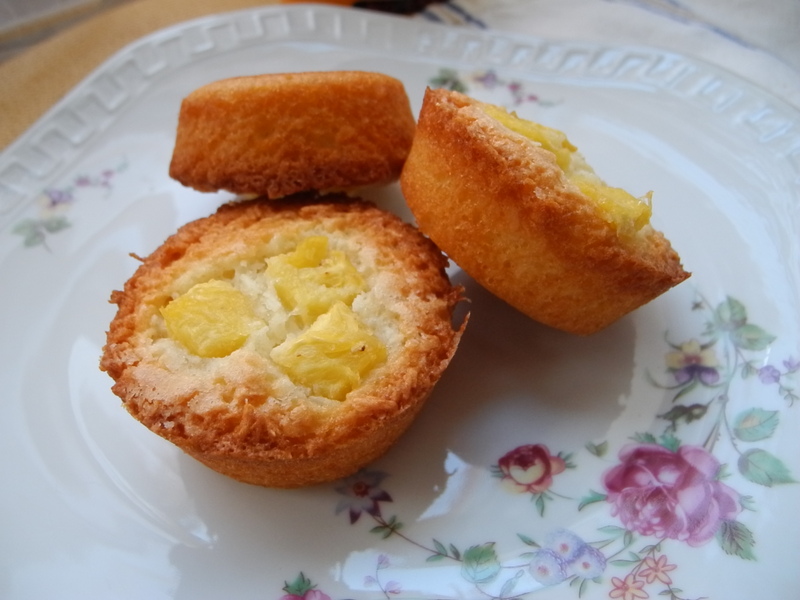 Adding pineapple to the coconut friands sounds like perfection. I’ll have to try that tomorrow!